1. 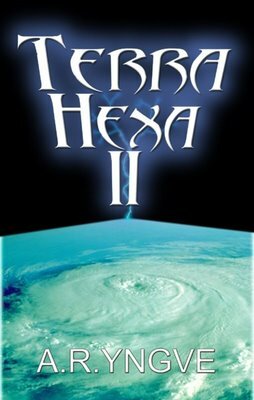 The Swedish edition of TERRA HEXA II (from Wela). 2. 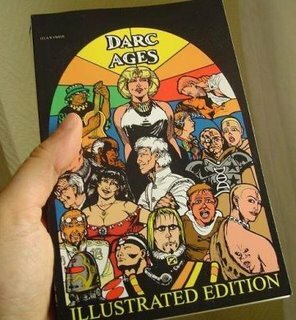 The CafePress paperback DARC AGES: Illustrated Edition. 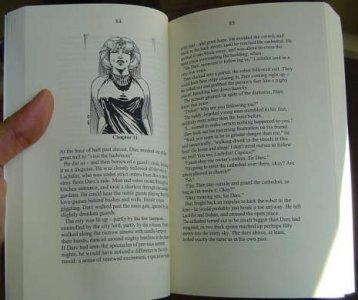 I took some photos of the book -- I'm fairly pleased with how the 35 interior illustrations came off, with only a minimal degree of "rasterization". About an hour ago Sheila Williams called me to tell me she'd been directed by the magazine's owner to kill my upcoming story "Wendy." Sheila accepted the story two months ago and I signed a contract for it two weeks ago. She told me she was about to send the proofs when she got the news that the owner was killing the story. The story's protagonist is a person with known genetic tendencies toward child abuse, at a time when these can be firmly predicted. The story is being killed due to the child abuse content. I've written a couple of stories trying to point out the fact that these wonderful technoloies we are developing will inevitably be used in depraved ways. "Wendy" is another story in that vein. I don't want to say much more in detail about the plot since I hope to sell the story elsewhere. I'm not posting this here to start a discussion about this action since I'm not likely to hang around for it. But this forum is a convenient way of letting other Asimovs writers know that this has happened. Sheila did offer to pay for the story but I declined. This was not her decision and I don't bear anyone any ill will over this since I knew I was pushing boundaries with this story - apparently a bit too hard, in fact. 1. The reactions are more interesting than the event that started the debate. That a publisher gets cold feet about a potentially very controversial story is hardly news. What IS news, however, is that now readers can actively debate the validity of the decision in a public forum. Has this happened in publishing before? 2. Some responded that the critics of the decision were harming the magazine -- especially since magazines like ASIMOV's, ANALOG and THE MAGAZINE OF FANTASY & SCIENCE FICTION have all suffered a steadily sinking readership for the past few decades. "Don't rock the boat!" 3. Do printed magazines for short fiction have a future? In the debate emerged a generally pessimistic attitude that magazines with short stories are headed for extinction. People either claimed the critics were "cutting off one's nose to spite one's face" (i.e. harming the magazines they wanted to support) or that it didn't make a difference what they demanded, because short-fiction magazines were not going to survive anyway. Personally, I think short fiction has a future. But perhaps not in the "classic" form of magazines like the above; some sort of electronic distribution will probably replace them. But the debate is a positive thing: it shows readers are passionate about what they get to read; they care, and they will be active participants in the future of publishing. The sequel to my young-adult SF novel TERRA HEXA, aptly titled TERRA HEXA II, has just been released in Sweden. 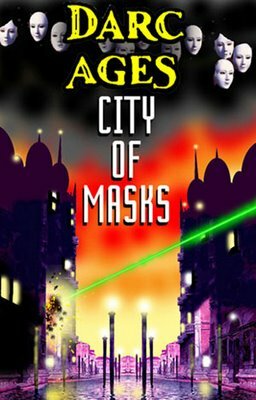 A sample has been posted on the publisher's website, HERE. 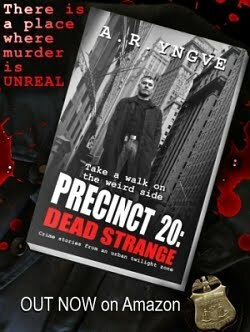 If you can't read Swedish, there are English text and audio samples from the first book HERE. I started a Flickr page and put some photos on it. And why? For the crass reason that I might get more attention for my books, by mugging for the camera. It's hard to be funny on purpose. And much easier to be unintentionally funny (as I've accomplished countless times). Someone warned me: the convention guests won't be able to take you seriously as a writer AFTER they see you as a goofy funnyman on stage. If a Really Serious Writer like Margaret Atwood appeared on a comedy club and made fart jokes, would people then say: "I can't read her books now. She's ruined her image!" Is it all about image? Then again: Why should writers take themselves so #*#¤%* seriously? I love non-fiction books just as much as good fiction, and I read lots of it. Seth Godin is a "marketing guru". His book explains how the game of marketing has changed, and how you can use this knowledge to create successful products and services. So why should writers and aspiring writers learn about such things? One: PURPLE COW may help you figure out how to sell your own books. Two: It also points out the power of originality and creativity in a media-crowded, affluent society. Disch is also a fiction writer and has worked in various genres (his greatest success may be THE BRAVE LITTLE TOASTER childrens' books). This book is a collection of his literary criticism. "Literary criticism," you think. "That sounds so dull." But Disch's writing is damn funny. He often attacks his subject from an unusual angle, offers original insights.. and is one of the funniest literary critics around. You learn something and laugh at the same time.